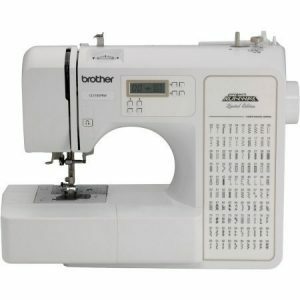 One of the most trusted brands in the sewing world is Brother. It is a huge brand that has built its reputation over the years; hence, it has earned the respect of quite a number of people. They are always bringing up sewing machines with the latest technological innovations to meets the demand of consumers. One of such product is the brother CE1100PRW sewing machine. And with this review, I will be discussing all you need to know about this product. Brother CE1100PRW It is an electronic sewing machine but not completely computerized. There are a total of a hundred stitches giving you more than enough options for your sewing. You have the option of eight different types of Auto-Size buttonholes, all 1-step. The LCD screen allows you to make stitch selection from the memory of the sewing machine. Before we proceed to discuss the rest of the amazing features, we thought to let you know the beautiful accessories that come with the Brother CE1100PRW. Variety makes sewing fun. Besides, to have successful and interesting projects, you need a selection of different stitches, which will also ensure that you can bring out your creativity in full force. One of the parts of sewing that is kind of annoying is making of buttonholes. However, the Brother CE1100PRW makes eight various buttonholes available at your fingertip. With this, you actually easily learn how to go about them, you also get to build your confidence and you sew with ease. If you are not well grounded in sewing, getting started could be pretty hard especially when you don’t have someone to guide you. With the Brother CE1100PRW sewing machine, you have a 100-Stitch available that makes your work seamless. Drop – in bobbin system is a patented feature exclusive to the Brother sewing machine brand. The beauty of it is that it makes your work so easy that you never want to use another thing again as soon as you get used to it. 5. 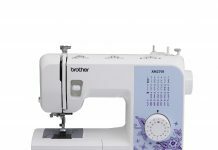 Advanced Needle Threading System Brother CE1100PRW also features an automatic threading system which is common to all sewing machines from brother. This is a big plus for people who find threading a needle difficult. For old people with bad eyes or little patience, this is a terrific feature that solves your problem. With the free arm of the Brother CE1100PRW, you can explore different lengths with your sewing technique. This feature makes it easy to sew cuffs and sleeves. 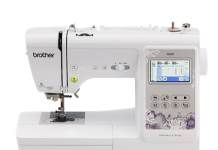 Many users have attributed the Brother CE1100PRW to be one of the most comfortable Sewing Machine to learn. This is not surprising as it has adjustments and controls easy to use and understand. When you study the user manual very well, you will be surprised at how easy it is to use the Brother CE1100PRW Sewing Machine. 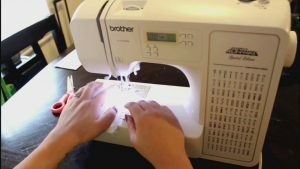 There is a DVD that comes with the sewing machine making it beneficial to beginners. First of all, you have lots of feet to choose from with this sewing machine. That aside, you have a hundred built-in stitches to choose from. This gives you the option to work at full creativity while developing skill and standard. With the clear cover, you get to easily monitor the Bobbin thread. There is a manual thread cover that makes your work easy. There is a lever which drops the dog thereby making free motion quilting a walk in the park. One of the things I love about the Brother CE1100PRW is the portability. Despite the fact that the machine is loaded with many features, it is not heavy. Weighing just 10.58 pounds, lifting and moving the machine about will be easy. Also, the dimension of the machine is 11.65 x 7.01 x 16.26 inches thus, it doesn’t take much space. Worrying about how or where to store the machine is off the table. Due to the fact that the Brother CE1100PRW was made with high-quality materials, it is pretty durable. Although, this also depends on how you handle, maintain and store it. After use, it is recommended that you clean with a soft and dry cloth. You do not have to worry about regular upgrading or upkeep except you want to start working on very heavy fabrics like leather. You will definitely use this machine for a long time so you get good value for your money. The Brother CE1100PRW delivers neat stitches without sacrificing speed. You will enjoy neat and even stitches. The quality of work it delivers is awesome, the reason why it is a terrific choice for beginners. 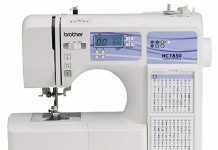 So far so good, we have done justice to the Brother CE1100PRW sewing machine review. It is one of the best in the Brother Project Runway series. It is the right budget sewing machine for beginners, experts, sewing courses and all forms of sewing sessions you might be interested in. It is ideal for beginners as it features computerized stitches giving them cool and neat stitches.